This is a super-fast way of cooking chicken breasts in the pan with plenty of bright flavour. Scrub the potatoes and cook in salted, boiling water for 15–20 minutes until tender. Add the asparagus and cook for 5–6 minutes. Cut each chicken breast in half horizontally and flatten with a meat mallet or put in a freezer bag and use a rolling pin. Lightly dust the chicken with the seasoned flour. Heat the oil in a non-stick frying pan and sear the chicken in batches over medium heat for 2–4 minutes on each side until cooked through. Set aside and keep warm. Drain the potatoes and asparagus; return to the pan with the butter, lemon juice, capers and parsley. Season, add rocket and toss. 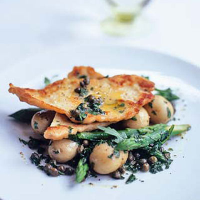 Serve the chicken, potatoes and asparagus on warm plates, drizzled with the buttery juices.